The Fellowship was fortunate enough to obtain a copy of HOT DAMN #1 from IDW Publishing. Ryan Ferrier writes, and Valentin Ramon draws and colors. This first issue is the beginning of one hell of an adventure. (I can’t imagine I’m the first to use that one.) Teddy Graham – yes, like the cookies – is on a “life” journey here, and there’s an awful lot of weirdness around him. I’m in just based on that. But then there’s the art. The level of detail in every panel is simply stunning, and downright hilarious most of the time. From the dude snorting blow at the funeral to the streamers on the fans in the Dark Lord’s office, it’s just fantastic how much cool weird stuff there is. This is a book you’re going to want to read several times, just because you’ll see something new every time. And I love that I’m saying that about such an irreverent title. Go get this one. 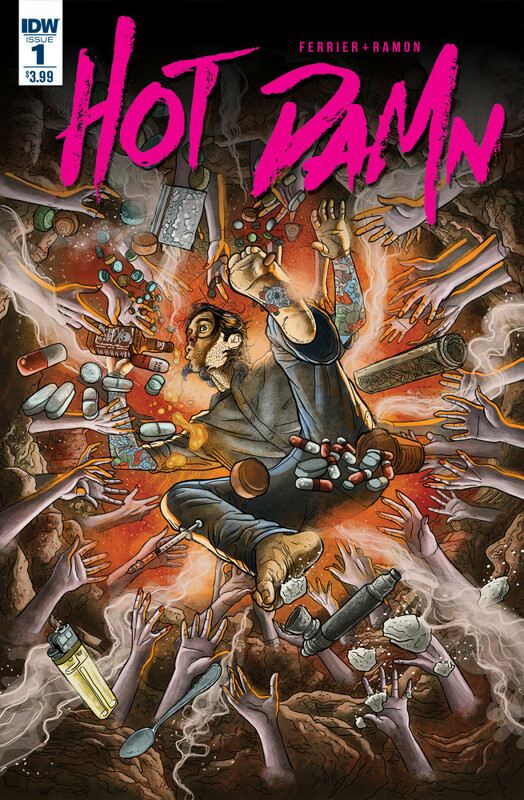 HOT DAMN #1 is available now at your FLCS or at idwpublishing.com.